I bought a hifiberry amp (a 2x25W class D amplifier with a fully digital path from the raspberry) and a PiTFT 2.8″ touchscreen. I’m planning to integrate them with my raspberry pi model B inside in a set of Mission 731i speakers. That will give me a set of powered speakers that can stream music over a wifi network, with a touchscreen interface. First thing to do was to connect both the hifiberry amp and and pitft to the same raspberry. They are designed to run exclusively on top of a raspberry, but they use different pins, except for the 5V power pin. So after wiring them carefully with jumper cables I managed to run them simultaneously. The raspberry will run squeezelite, so it will act as a squeezebox player. Squeezelite is a headless application, so it does not provide any interface that can be controlled from the touchscreen. 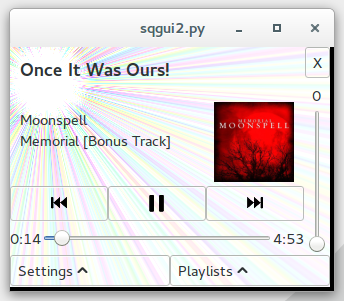 The sqeezelite player is controlled by a squeezebox server (also called logitech media server). I decided to build a GTK app with glade and python to run on the touchscreen (and obviously I’ll use Bluefish to do the python coding). I previously used pygtk or gtk with C, so first I had to learn the new way to use gtk3 in python, but that turned out to be fairly simple. I start the app in .xinitrc without any window manager or decorations, so it runs fullscreen without any possibility to switch to another application. Startx is called from .profile if the tty is tty1, and tty1 is set for auto-logon – so power on means boot, X and then the app. Second challenge was to control the squeezebox server from the app. Luckily the squeezebox server uses a very simple protocol, a tcp connection to port 9090 with ascii line based commands and urlencoded results. The next button can simply send the command “aa:bb:cc:dd:ee:ff playlist index +1”, pause sends “aa:bb:cc:dd:ee:ff playlist mode pause”, etc. Basic functionality was working quickly. However, any squeezebox player can be controlled from any device (smartphone, tablet, etc. ), so another device might be changing the volume, pressing pause, etc. and my app should display the new corresponding status. The squeezebox server has a “listen” command for that, this will send any event over the tcp connection, again line based and urlencoded. I chose to open a second tcp connection. To make the application respond quickly, both when doing socket I/O and responding to GUI events, I run the connections in separate threads. The commands are put into a python Queue, and the threads send their results to the mainloop using an idle callback. In the idle callback I use regex matching to find the interesting events and update the GUI accordingly. I’ll probably use a dark theme when running on the PiTFT. More on this project later, and I’ll publish the full code soon. Tried PiMusicBox? I’ll post about it soon. PiMusicBox cannot play squeezebox streams, and all my music is on the squeezeserver. Is the hifiberry amp powerful enough to drive those Missions? What do you think about the audio quality? Just asking because I’m thinking about hifiberry vs. active monitors. Would love to have a small raspi powered high-endish hifi setup. yes, I don’t hear a difference between my hifi amplifier and the hifiberry amp. These Mission speakers are the limiting factor for the sound quality. Sorry for the late reply. The hifiberry + Mission 731i is powerful enough for a normal volume in a normal room. But not more than that. More efficient speakers would probably do better. Sound quality is good – the quality is limited by those Mission speakers, not by the amp. I tried the hifiberry also on my Philips FB815 speakers and the quality was much, much better. Interesting read. Regarding the exclusivity of the Hifiberry and TFT screen using the GPIO, I was wondering how you did the wiring. Both come with the GPIO connector connected to the pcb. Did you remove the GPIO connectors and resoldered the jumper wires to the pcb or is it possible to connect the jumper wires directly to the GPIO connectors using female to male jumper wires. Reason I’m asking is because I have the same Rpi (model 1 B Rev 2 with 26 pin GPIO pins) and I want to do something similar. It is my first real project, so could use some advice. I’ll be using a breakout board but also there I would like to know whether it is possible to use jumper wires to connect the screen to the breakout board without removing the GPIO connector on the screen pcb (connect without soldering). 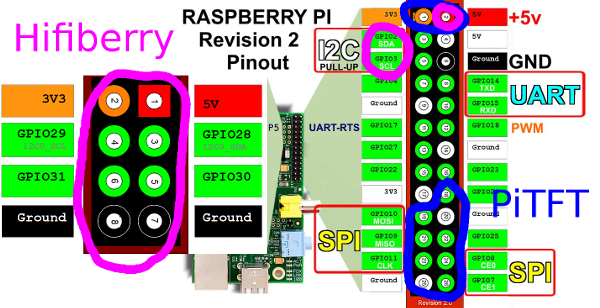 Using the female side to slide over the Rpi GPIO connector pins and the male side to go into the breakout board. I did not remove the PCB connectors, but I splitted a flatcable coming from the raspberry side to go to two connectors on the pitft/hifiberry side. Thanks for your swift response. I see. That is indeeda different way of getting the same result. Fwiiw, through lotsa reading I learned it is possible to use jumper wires to make a direct connection between the Rpi GPIO pins and the device pcb pins.